At Triage, we don't spend a whole lot of time thinking about what we've already done. The mentality in the 4 walls of our HQ (it might be closer to 10) is very focused on constant forward progress. How do we make today better than yesterday? How do we find that Med Tech the job in rural Washington they're dreaming about? How do we help a facility find an elite team that will make their patients feel taken care of? You get it. Resting on our laurels isn't an option. That said, we know for healthcare travelers that haven't worked with us yet, the opinions of your peers and industry leading publications are important in making your decision of who to travel with, and they should be. If you're on the fence about taking your next assignment with Triage, we hope these testaments from your peers convince you to give us a shot! In both 2017 and 2018 Triage was recognized as the #2 Best Travel Nursing Company. One distinction that we think is pretty important is that of every company considered, travelers ranked Triage Healthcare Staffing higher than any other agency (we missed out on #1, because we weren't most improved)! This type of recognition means the world to us. From our inception, we've strived to build relationships deeper than simple business transactions. Receiving so much positive feedback gives us confidence that travelers do want the relationships our recruiters work to deliver. 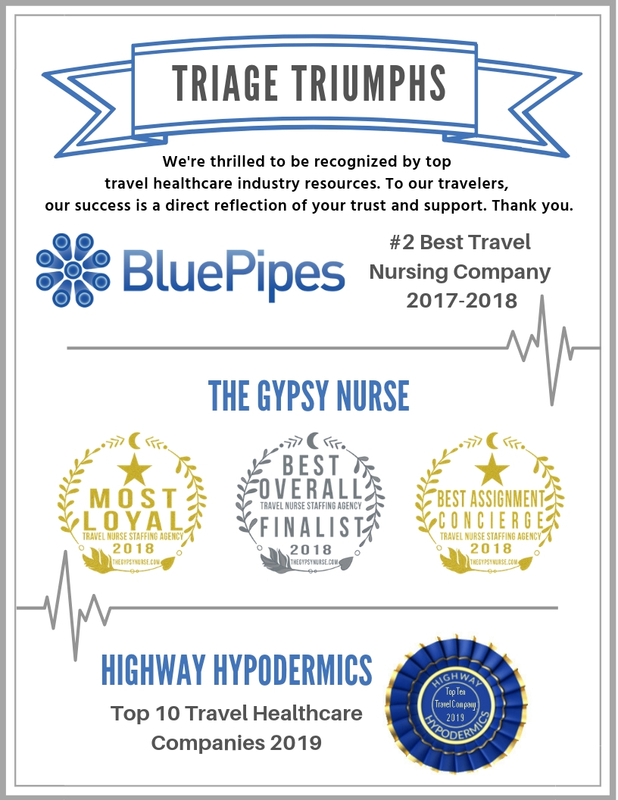 In late 2018, The Gypsy Nurse conducted an incredibly in-depth evaluation of travel nursing agencies. This included research from not one, but two independent firms, who reached out to over 100,000 travelers in their research comparing 100 healthcare staffing providers. The results of this massive evaluation also reflect our relationship-first approach. Winner of Most Loyal Award: This award highlights the agency with knowledgeable recruiters who address concerns quickly and genuinely want to get to know their travelers. Given what we noted above, this is just another reason we're proud of our approach. Winner of Best Assignment Concierge Award: This award highlights the healthcare staffing company with the best connections to qualify facilities in top locations. Our facility-side team approaches relationships with healthcare providers the same way our recruiting team works with travelers, so we're glad it too is paying off! Finalist for Best Overall Agency: This award was given to the agency with the highest aggregate score. While we didn't take clinch the top spot, we're still honored to have been a finalist! Similar to the BluePipes award, Highway Hypodermics aggregated scores on their own site in early 2019. Their extensive review process takes about 15 minutes to complete, so we're complimented that people who've worked with Triage took the time to share their thoughts and allowed us to be ranked as one of the Top 10 Travel Healthcare Companies 2019.